Radiocarbon dates from the ancient city of Caral, (10* 53' 30.72"S - 77* 31' 18.84"W) in the Supe Valley of Peru, 23 km from the coast, show that monumental architecture there was under construction as early as 2627 B.C. until about 2000 B.C., even before ceramics and maize were introduced to the region. (By comparison, the Great Pyramid of Khufu in Egypt was built between 2480 and 2600 B.C.) Also remarkable is the enormous size of the urban complex: 65 hectares in the central zone itself, encompassing six large platform mounds (or "pyramids"), many smaller platform mounds, two sunken circular plazas, and diverse architectural features including residential districts. Caral is by far the largest recorded site in the Andean region with dates older than 2000 B.C. and appears to be the model for the urban design adopted by Andean civilizations that rose and fell over the span of four millennia. Excavations at Caral have been undertaken by Jonathan Haas from Chicago's Field Museum, Ruth Shady Solis of the Anthropology Museum at the Universidad Nacional Mayor de San Marcos and the Field Museum, and Winifred Creamer, Northern Illinois University and the Field. It was featured in a Science article in April 2001, after a long and careful investigation into the radiocarbon dates from the site. 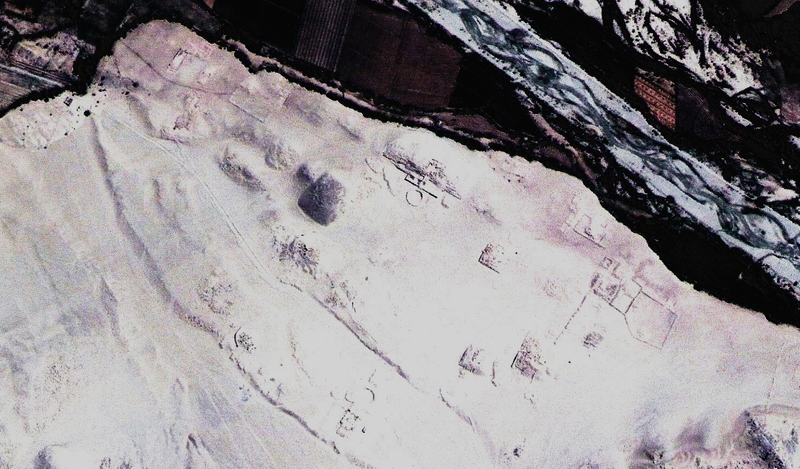 The interesting thing about Caral and the rest of the Supe Valley sites, is that it illustrates the problems archaeologists have dealing within so-called "urban settlements" and "state societies." Building monumental architecture such as pyramids and irrigation canals and cities takes sophisticated planning. When archaeologists first came upon the cities of our ancient pasts, we began developing our theories of why states rise. One of the most prevalent theories was that it takes a combination of factors to create the political climate that creates public works; and that usually means full scale agriculture, craft specialization, a writing system, ceramic production, social stratification, even metallurgy. 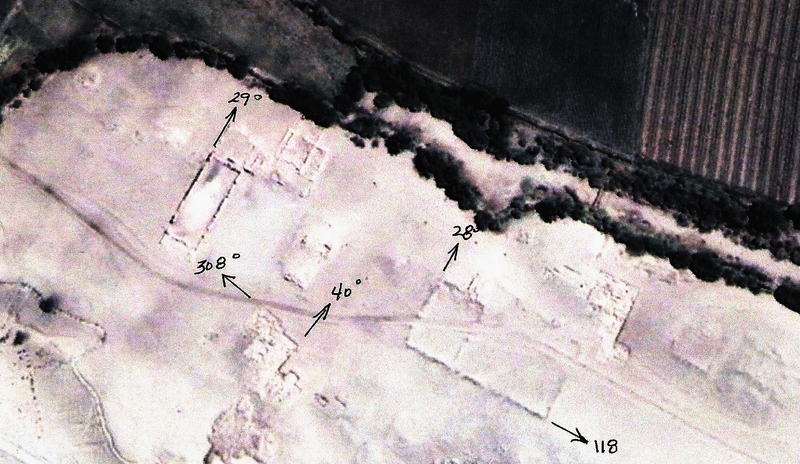 But the Supe Valley sites, and other early urban settlements such as Catalhoyuk in Turkey c6300-5500 BCE, apparently arose without all of these elements. Although we can't know the political structure of the people who built Caral, to date no ceramics, evidence of metallurgy or writing has been found. Dr. Shelia Pozorski, a professor at the University of Texas-Pan American who with her husband, Tom, has studied other Andean sites for 30 years, said the finding helped overturn what has been known as the maritime hypothesis. This is the idea that complex Andean societies, precursors of the Incas, evolved from the coast, where reliance on fishing required some level of social organization, to inland sites, developing fully only when ceramics appeared around 1800 to 1500 B.C. "It makes it more of a quantum leap, rather than a moderately rapid crawl," Dr. Pozorski said. "Rather than having coastal precursors to inland complexity, the two areas are developing at the same time." Another expert in Andean anthropology, Dr. Richard L. Burger, director of the Peabody Museum of Natural History at Yale, described the new work as "the nail in the coffin of the maritime hypothesis." Dr. Haas said, in his paper on Caral published in the journal Science, that before the rise of Caral civilization in the region amounted to a few small coastal villages, with perhaps a hundred people or so in each, and other smaller bands of hunter-gatherers. By 2700 B.C., he said, several larger villages began to appear. "But then all of a sudden you've got Caral, and probably at least one of its neighbors," Dr. Haas said. "It's bigger by an order of magnitude than anything before." 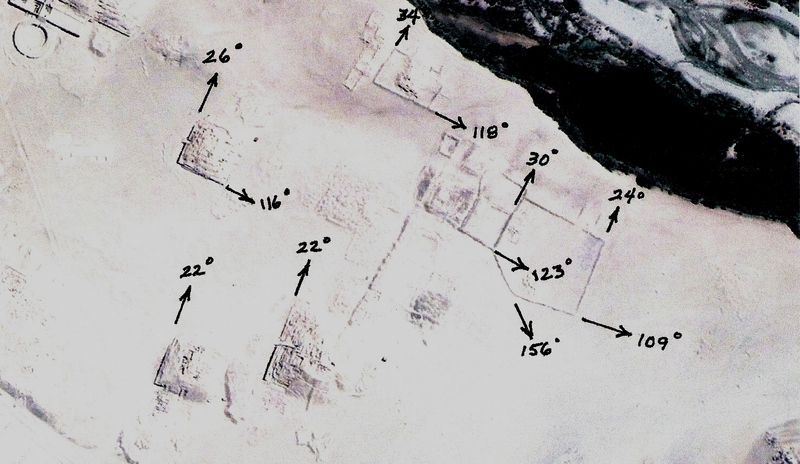 While it is not yet possible to estimate the population of Caral — much more archaeological work remains to be done — Dr. Haas said that the number was in the thousands, not hundreds. Dr. Haas studied Caral with his wife, Dr. Winifred Creamer, a professor of anthropology at Northern Illinois University, and Dr. Ruth Shady of the Universidad Nacional Mayor de San Marcos in Peru. Their paper dating and describing the site was published in a previous edition of the journal Science. Caral was first discovered by archaeologists about 1905, and has been explored only intermittently. Anthropologists have largely ignored Caral, considering it puzzling, Dr. Haas said. Pottery has never been found at the site, and its absence would ordinarily suggest that the civilization existed before 1800 B.C. But Dr. Haas said that for many experts the sheer size of the place — and the level of societal complexity that it implies — meant that it had to be newer. The consensus, he said, was that "something that big cannot be that early." So the lack of ceramics, by this way of thinking, was only an anomaly. Since those statements the City of Caral has been carbon dated to 2627 BCE. The Sacred City of Caral-Supe (Peru), the oldest centre of civilization in the Americas, was inscribed on UNESCO’s World Heritage List by the World Heritage Committee, chaired by Maria Jesus San Segundo, the Ambassador and Permanent Delegate of Spain to UNESCO. This study involves the ancient science of Geoglyphology. Geoglyphology has been secretly passed down through time for over 30,000 years. The re-discovery of Geoglyphology, as it relates to the current study of Archeology, is used to expand both the search area and the knowledge base available to the Archeologist. Until now the majority of the information available to the Archeologist is gleaned from the information recovered at the dig site. In recent years it has been discovered that a great majority of the ancient architectural, monolithic and geoglyphic structures built around the world had something in common. That commonality is that the structures were aligned in such a manner that the study of their linear alignment unveils a much larger story and immensely expands the data available to the archeologist and the related disciplines. Concurrently with the Geoglyphological alignments there sometimes exists an astrological component of the structures. These two factors point to ancient cultures much further advanced than we have ever thought possable. 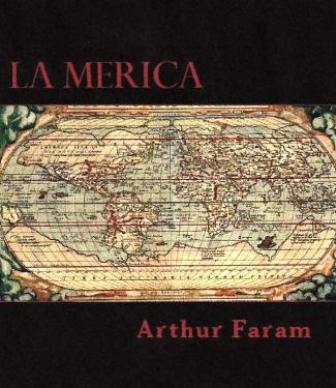 Data recovered from these studies includes obtaining the geographical range of the culture being studied, the level of sophistication that existed in relation to their understanding of mathematics and geometry, their knowledge of world geography, the discovery of other archeological sites that were unknown prior to the studies, and the dating of the culture itself by the data collected at the offsite locations identified by the alignments at the dig site. The success of these studies leaves no doubt that Geoglyphology can play a major role in expanding the knowledge base available to the Archeologist and other researchers. 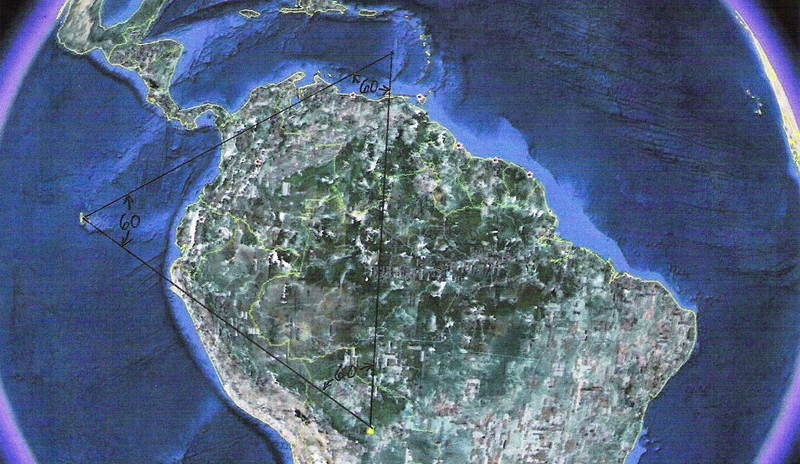 The computer software "Google Earth" was used to perform the calculations used in this study. 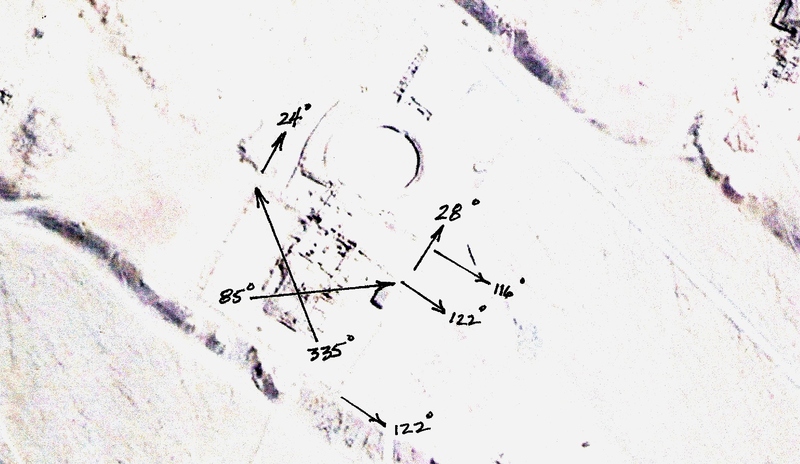 In this study, bearings refer to the magnetic bearings that are obtained from the geoglyph at the site of the geoglyph. Magnetic bearngs can only be used at the point of origin. When projecting the bearings across long distances magnetic deviation will distort any projection using a compass. Therefore a true heading (a straight radial) must be used in projecting the magnetic bearing which exists at the site. That is the reason the software Google Earth is used to project these bearings on a true heading. After leaving the origination point the projections are known as radials. This study was undertaken after the discovery of several Geoglyphs, the likes of which had never before been reported. The only way that this was made possible was by using the flexibility and accuracy available in the Google Earth software program. This software program contains a model of the surface of the Earth made from a composite of actual satellite photos. The program has great flexibility and allows for a host of adjustments, depending upon the operators needs. The one most crucial to this study is the ability to draw a line on the face of the Earth while at the same time reading the magnetic bearing from the source and the true heading of the extend radial, without magnetic deviation being a factor. The program also incorporates a zoom feature which allows a close-up view of the Earth's surface as depicted in the photos that follow. As stated before, Caral, Peru was chosen as the centerpiece of this study because of two factors. First, it is a new find and still has many mysterious and unknown aspects. Secondly, it is a large complex that offers many geoglyphical aspects. The findings of the Caral study are described below. Caral was inhabited between roughly 2600 BCE and 2000 BCE, enclosing an area of more than 60 hectors. Caral was described by its excavators as the oldest urban center in the Americas, a claim that was later challenged as other ancient sites were found nearby. Accommodating more than 3,000 inhabitants, it is the best studied and one of the largest Norte Chico sites known. Dr. Shady's belief in a civilization stretching East to the mouth of the Amazon River is substantiated in this study. Other studies confirm that the civilization, of which Caral was part, used the Amazon River for transportation from it's headwaters to the mouth of the river. Headlines have been appearing recently about geoglyphs being found all through the Amazon Jungle as land is cleared for farming. The Caral complex was split into the five main sections addressed in the photos below. This was done to allow for close-up photos and a more detailed description. The radials described below the photos are the endpoints for the given radial. It is our experience that the creators of geoglyphs will present some sign that verifies that the purpose of a geoglyph was solved correctly. 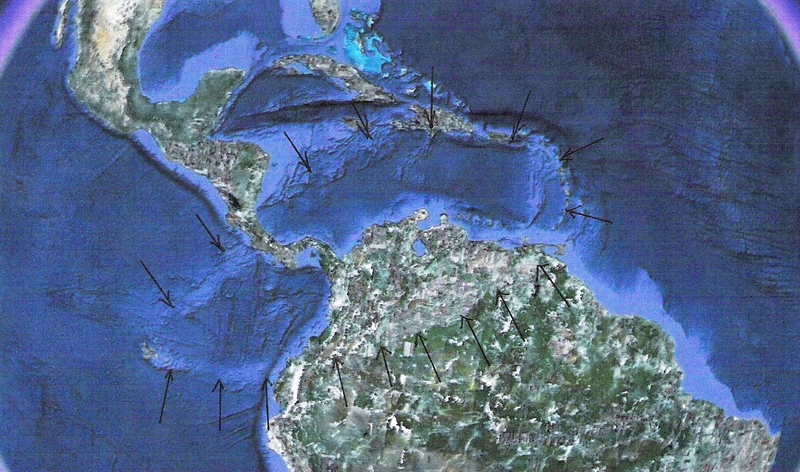 In the case of the Caral glyphs that verification is the 360/180 degree line that begins in the center of the meteor crater, as defined by the Antilles Islands, and proceeds South in a line that passes through the circle glyph, identified by the Caral 116 and 117 degree radials, and terminates precisely at the tip of South America. 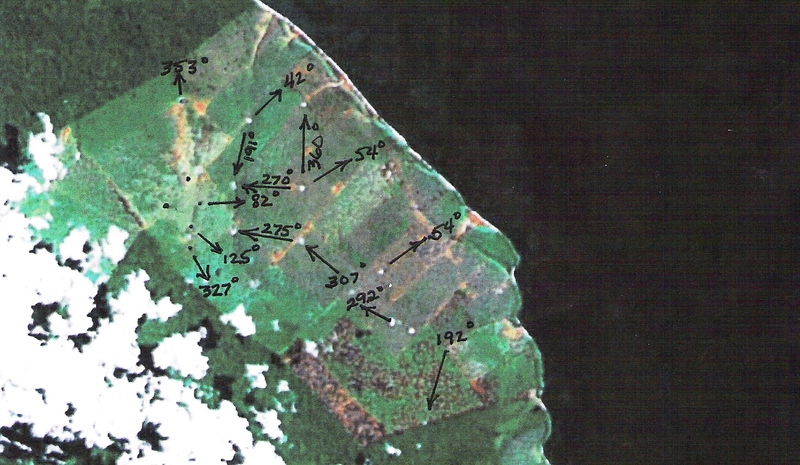 By outlining the crater with the Antilles Islands endpoints the originators demonstrated not only their accuracy but their knowledge of the topography. Another confirmation is the Equilateral Triangle formed by the Galapagos Islands, the center of the Columbian meteor crater, and the man made circle glyph identified by the Caral 116 and 117 degree radials. The following photo array is a presentation of our findings. The Santa Rosa Geoglyph is 22 miles across and was defined by the Caral 116 degree radial touching the Northeast side and the 117 degree radial touching the Southwest side The topography of the Glyph does not seem to lend itself to volcanic or meteorite action but appears to be manmade. 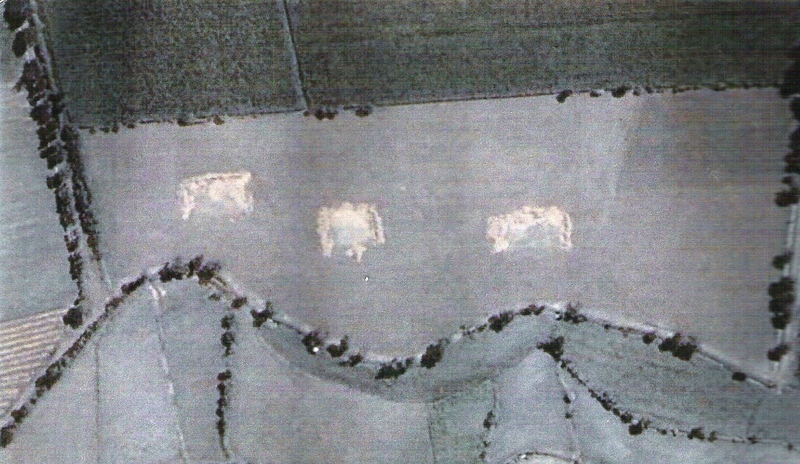 Farming and the river have divided the glyph on the West side. Therefore part of the glyph is West of the river. This glyph was strategically placed to form the geometric designs that are depicted in the following photos. 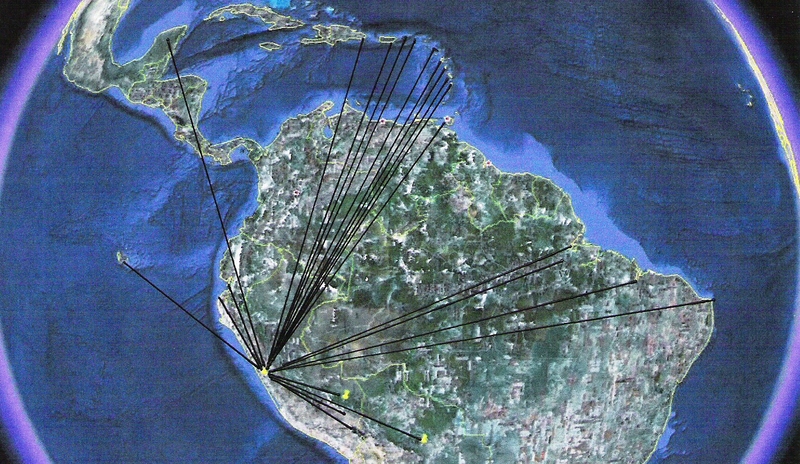 The Columbian Triangle, as Outlined by the Endpoints of the Caral Radials. 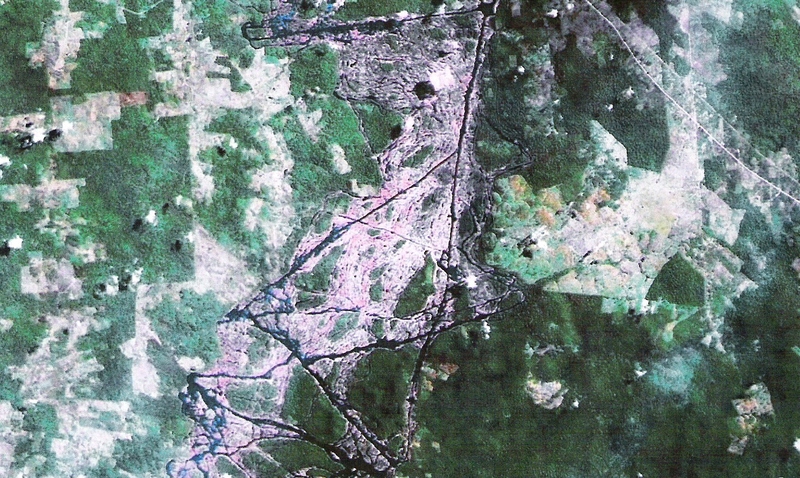 The triangle is composed of the Galapagos Islands, the Santa Rosa Geoglyph, and the center of the Colombian Impact Craters’ final resting point. The center of the crater was defined by the Caral radials pointing out the islands forming the half circle around the crater. The vertexes of the triangle form a perfect equilateral triangle. 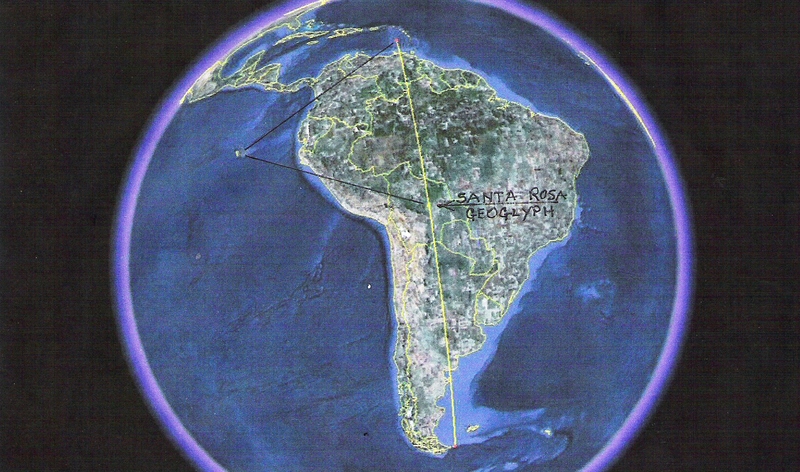 The 360/180 Degree line and Colombian Triangle as they relate to the Santa Rosa Geoglyph. The Equilateral Triangle and the perfectly placed North/South line that crosses South America is the validation, mentioned previously, that the puzzle was completed as intended by the originator. In addition, it is most likely a land claim on South America. The Columbian Crater is defined in the above photo by the arrows that appear around the perimeter. The Tectonic plate which runs along Mesoamerica has most likely caused the rift to rise, thereby reconnecting North And South America. This is illustrated by the two different colors of earth that exist along the crater edge. The center of the circular part of the crator, on the east side, is the end point of the line that runs through the Sants Rosa circle to the precise tip of South America. Above are a few of the ruins at the ancient city of Barranca, Peru. This location is identified by the Caral 304 degree radial. This city could be older than Caral by the fact that it is closer to the ocean. This geoglyph, identified by the Caral 075 degree radial, is actually a series of man made canals designed in the shape of a star. The Altamera geoglyph mirrors the territory depicted in the Caral Geoglyph. This would tend to place habitation of the area in the same time period as Caral. 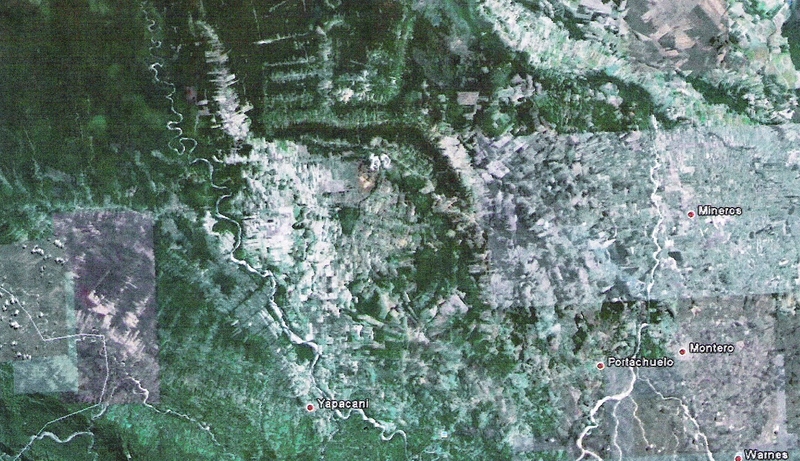 This glyph is a few miles north of the Altamera Canal glyphs and West of the mouth of the Amazon River. The glyph is most likely of later origin. First of all it is composed of light colored objects and lines placed in a strategic order on the ground. Secondly, it speaks of places not mentioned in the Caral and Altamera glyphs. By the time this glyph was made the originators were aware of the African Continent. The following statement in the Journal of Science fully illustrates why the use of Geoglyphology would benefit the field of Archeology. "Paul Kosok discovered Caral (Chupacigarro Grande) in 1948, but it received little attention until recently because it appeared to lack many typical artifacts that were sought at archeological sites throughout the Andes at the time." 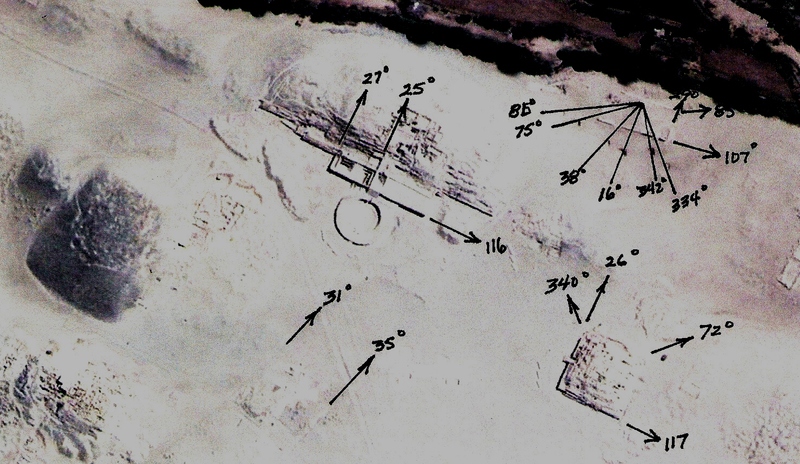 The use of Geoglyphology, had it been available in 1948, would have given Dr. Kosok other avenues to explore which were directly related to the newly discovered site. The archaeological findings in Caral seem to coincide with many other major complexes around the world such as: The Yanoguni Pyramid in Japan, Mohenjo Daro in Pakistan, Gobekli-Tepe in Turkey, and numerous other monuments, and monoliths, around the world. Their commonality stems from many factors. The most common trait being that: in the lower layers of the digs there appears to be little, if any, evidence of permanent habitation. This includes primarily tools and pottery. Another thing that they share in common is their construction includes amphitheaters, or overlooking landscape, which would allow for the observation of some type of ceremony. Sexual conotations are suggested by the many phallic symbols on Yanoguni Island and in the construction of the Pyramid itself. ( See: http://www.yonaguni.ws ). This same theme is displayed in discovery of large quantities of an aphrodisiac, in the ruins of Caral. The second feature which they all share is that, using the ancient science of Geoglyphology, they all denote territories very similar to the territories mentioned by Plato in his work titled "Critias". This would imply that rather than the structures being the start of civilization, the original inhabitants were the remnants of one of the Earth's many cataclysms. They may have been very advanced people, without the tools of their previous culture, beginning the repopulation of the Earth. As Plato suggested in his work Cretius, the Geoglyphic nature of these structures would indicate an assignment of territories and the rebirth of our current civilization. 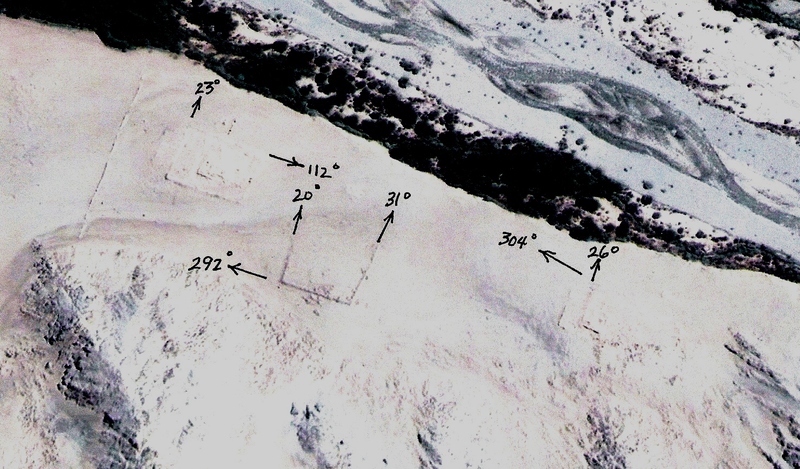 Geoglyphological geoglyphs can hasten and enhance the discovery of critical information not otherwise available to the scientist at a newly discovered site. Geoglyphological geoglyphs can indicate at least the minimum range of the geographic dispersement of a civilization. Geoglyphological geoglyphs can uncover a hidden sophistication in a society which may have gone unnoticed from data gathered at a dig site. Geoglyphological geoglyphs can reveal other sites, related to the initially discovered site, which may have never been discovered. Geoglyphological geoglyphs may provide critical information about a society that was not available at the originally discovered location. http://www.gosanangelo.com - Postcards From the Amazon: Massive clues of Amazon area's past Jeffrey Hoelle - San Angelo Standard Times - Posted July 31, 2010 at 6:56 p.m.
Archaeology and The American Journal of Archaeology, published by the Archaeological Institute of America. 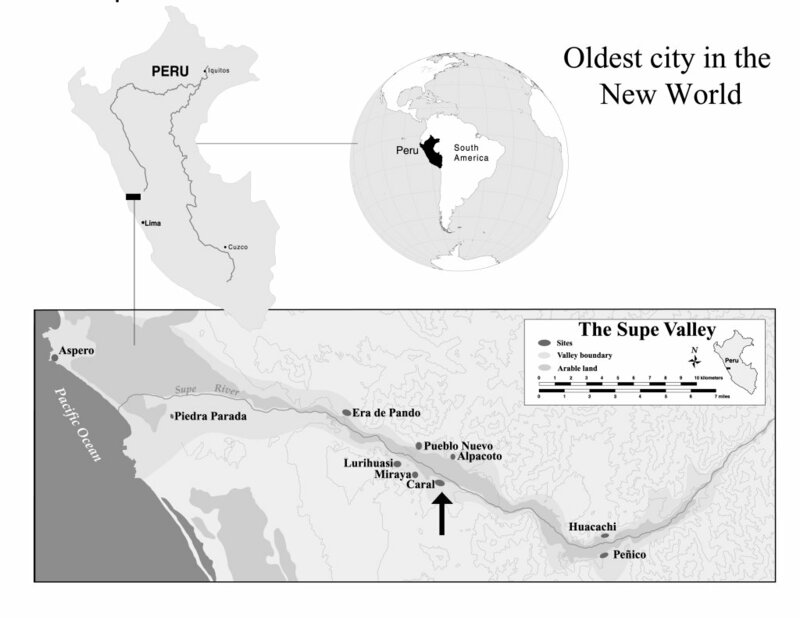 Peru Holds Oldest New World City (Science News). The revelation of an ancient science that has marked the territories of ancient cultures for over 30,000 years.